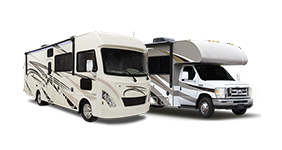 The engineered durability and the superb interior finishing of these spacious wide-bodied Motorhomes are designed to carry you comfortably on any adventure, through all four seasons. An abundant amount of exterior storage in each of the available models will allow you to safely stow your bicycles, golf clubs, and skis, or any other essential items you may require to enjoy your leisure time activities. Constructed with the Patented Fibercore Wallsystem®, built on the Ford E-450 chassis, with seven interior floor plans to choose from, there is a Bigfoot 3000 Series Motorhome just right for you.